Honestly, my memories of the “Little White House” are vague at best. But as we toured the grounds and the museum, the memories came back. I was just a baby in November 1946 when President Truman first visited Key West, and made it a working remote White House primarily during the months of November and December; and February through March. 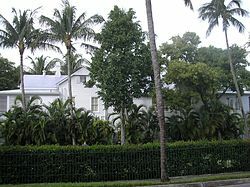 Since then Presidents Eisenhower, Kennedy, Carter, and Clinton occupied the Little White House at times. This entry was posted in Uncategorized on November 29, 2012 by stevesparks.